I recently found a very neat company called Ozeri that makes different kitchen, bathroom, and fitness products. I had the opportunity to review a couple of their products including the Serafino Double Wall Glass Set and the Precision Pro II Pro Bath Scale. I was excited to try out these glasses because they looked different than other glasses I had seen before. My favorite feature about the glasses? That they can hold both hot and cold liquids! How cool is that. You can put a hot coffee drink in there or an iced tea. 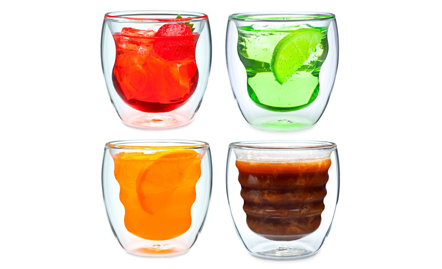 The glasses are 12 ounce and come with 2 for $24.95. Because of the double wall, you can keep your hands cool with a hot beverage and free from condensation with a cold one. My opinion? I love them! I enjoy drinking coffee out of a clear glass. It just seems fancy! The glasses look nice and seem to be nice quality. I was also able to review the Ozeri Precision Pro II Bathroom Scale which retails on Amazon for $28.95. It is a digital scale that holds up to 440 lbs. It has a LCD screen with a Blue Backlight so it is easy to see. I like the sleek design of this scale and it is very easy to use. Just step on, wait a few seconds, and you will know your exact weight. I really like both of these products from Ozeri. 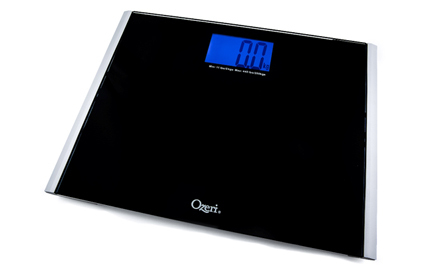 Ozeri has decided to generously give away two of the scales pictured above and 2 sets of the serafino glasses to 4 different readers of The Nutritionist Reviews! I would like to have the scale. Ours is old and probably inaccurate. I would like the scale, I don't have one. I would like the scale. I would love to win the glasses! I'd like to win the glasses! I would like the glasses. I would choose the scales. I have to pick one??? I guess I'd pick the glasses, but the scale would be great too. I'd rather win the scale; mine is over ten years old. I like the glasses. But the scale is cool too. I'd be happy with either! I probably should say the scale, because mine never matches the doctors, but I like the glasses also! I'd be happy with either one. I would rather win the scale. I would like to win the scale. I would rather have the scale because mine is so old and inaccurate. I would love to win either, but if I had to choose, I'd say the glasses! Thank you so much! I would prefer the scale. I would rather win the glasses, they are so unique! I could really use the scale-however, the glasses are really cool and would be fun for parties! I'd rather win the scale because I don't have one...but the glasses are great too! Oh gosh! Both! But I guess the glasses! Love these! I WOULD MOST LOVE TO WIN THE BATH SCALE PLEASE! That's one thing I didn't get enough of at my wedding...nice glasses! i would want the scale, ours is broke. I would love to win the scale. I'd prefer to win the glasses; thanks for the chance. I'd prefer the scale because mine isn't that accurate but I also really like the glasses. I love both but I would love to own the Bathroom Scale, I do not have one. I want to win the Precision Pro II Pro Bath Scale. The scale. I mean, I don't want to know but I do need to know! LOL I am not a slacker though as at 56 I hike 3 miles a day and eat a special diet. I'm excited about the scale. My bathroom scale is so old looking. You can see the glue that's holding the top piece on. As you can tell, I would really like to win the scale.